With only 4 days left of the Jason's Hope fundraiser on GiveForward.com, the final push to help raise the $5,000 needed for medical bills is making a big push. 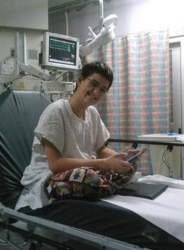 Teresa Stokes, Jason's mother has created Jason's Hope a GiveForward fundraiser to help raise awareness and funds for Jason's medical expenses. In 2006, Jason was diagnosed with an unknown form of Muscular Dystrophy. Over the past six years, doctors performed DNA tests, Muscle Biopsies, Nerve Condition Tests and Echo Cardiograms, and still had no idea what form of MD Jason had. Jason's muscles were slowly breaking down, but his heart was healthy.